"Doctor, are you okay? " Doctor... Ah... Good. They didn't suspect. Then, they got in an uproar over some approaching natives, and asked me to take them elsewhere... Having no objections, I let the TARDIS drift into temporal orbit... I returned to the back, and started preparations... I went to the chameleon circuit, and removed the buffer that I had installed to prevent it from working. I needed time to rest, time to plan. I had not expected opposition this early. Nothing I couldn't overcome with my current resources, but one needs time to truly assess a fitting vengeance. I was halfway through the roast capon when they decided to call me. I smiled at Steed, and reassured him that everything was fine. No, I had no idea why Suehprom thought I was the Master. (How HAD) he found out? I must locate his home sometime, perhaps some answers will be found there.) I invited Steed down to join me for supper. Then, I left the room and set up a tactile hologram. No sense in exposing myself to unnecessary danger. Via the hologram, I arranged a truce. We would drop Suehprom off at a neutral location. After Steed left, I slipped into the armory. I grabbed an adamantium blade and a garrote. I also filled a few darts with my shifted blood, they would turn to small parasites and devour anyone hit from the inside out. It was about that time that I noticed a few warning lights on the TARDIS monitor. Some powerful mind was slowly overloading the Eye of Harmony, via constant battering at the shield I had enabled I could guess who it was easily. I filled her in on the situation, and she seemed most interested in the fact that Suehprom was causing a ruckus. She asked what form might be best to talk to the poor fellow in. There are some days when it all falls together, and opportunities arrive that cannot be missed. After rejoining the others, we laid plans to entrap Dr. Plutonium, for study at a leisurely rate. I agreed to let them use a room in the TARDIS. (If anything went wrong, I could just jettison the room.) Why was I helping in this foolish venture? There was an opportunity for power here. The Creed had gone multidimensional, and found an intriguing way of recruiting others... They would make an excellent study. Their technology was worth stealing. All was in place. I retired to the lower levels of the TARDIS, for time to contemplate. "For these and other crimes..." The council president droned on, over my restrained form. I lifted my head to get a better look, and immediately regretted it as the gravitonic bands forced me back down. Something wasn't quite right. Above me, the old fool finished his speech. I could see him look down at me, carefully avoiding eye contact. "Do you have anything to say before you are sealed into a TARDIS and sent into limbo to contemplate your crimes for all eternity?" I am raised up to a standing position by the guards next to me. And I realized what was wrong the second I laid eyes upon the president. "I've changed my mind. Guards, the pistol." I snapped awake, out of my...dream? hallucination? Disturbing that I should lose control for even that brief a time. Yes, my subconscious was telling me something.... and the message would not be overlooked. I sat down at the console, and observed my faithful pawns at work. And then, a flicker of activity caught my eye. I moved to correct the instruments, but it would not be corrected. "Something is wrong. Leave." I informed the others. They would merely be in the way. With clenched teeth, I started the room reprogramming procedures. Someone was attempting to delete the TARDIS. The others had left, so I performed a more thorough sensor sweep of the source. Gallifreyan technology was being used against me! Only the fact that my alterations after I left were light-years ahead of my ex-home world's tech level was saving me from instant dimensional compression. With no other option, I shunted the TARDIS as far from the scanning beam as I could. To Amber. I appeared to have materialized as a false door, in a rather seedy bar. No sooner did I appear than someone attempted to open the door. The scanners showed Blazer, looking rather drunk and wearing a sailor's outfit for some reason. After some tomfoolery with an out of order sign, he left and the bar closed. Rushing to the bio laboratory, I made a lobotomized clone of myself. I would control the clone mentally (I love doing that trick...), while my body produced glands under my skin that would let me blend into the surroundings. I also programmed the clone to melt down if it was seriously damaged. An hour later, tastefully attired in green and black, I departed through a back alley. (Pausing to horribly kill a generic thug along the way.) I had detected an area of dimensional stress nearby, and I took the roundabout route to reach it. I passed Blazer again, but decided to leave him alone. (I did, however, create a blood flea to spy on him and report back after a while.) He was a little too powerful and unpredictable to be a good tool. I decided that a horse would come in handy, so I stopped by the stables of my old friend, Steed. The stable master was only too eager to give me a horse. In return, I gave him the memory of selling it to Blazer, and tucked a hefty bribe into his pocket as incrimination. As I walked off with my newfound toy, I let a bit of my blood dribble into the horse. Nothing like a little biological reformatting on the fly. As I stepped closer, the sound of hoofbeats filled the cave. Someone was arriving. Cursing my ill luck, I hurried out to see who it was. Ge'rard. Before he could see me, I slashed myself across the chest with my sword, and staggered out to fall onto the ground. He dismounted and turned me over, and I choked out (while stifling a chuckle). "Mentally controlled...me...made me...stab...I'll get help..." I staggered to my horse, and climbed on slowly. I rode off, slumped over. That's where I should have left it. For the 13 lives of me, I don't know why I turned back. I directed my clone into the room where Cat and Ge'rard were talking, and shifted my form to that of my former incarnation. I gloated a bit, and made to attack her with a drawn sword. (Through the clone of course). Then I jumped my own clone, and attacked it viciously. I tried to remember the old Doctor's personality as well as I could, and stammered an incoherent explanation about clones, duplicates, and god knows what else. Then I left. I returned to the TARDIS wondering what insanity had overtaken me. After putting my new Hell-steed in the eugenics lab stasis, I set up the memory-wipe machine. For about a week, I would remember only that I came to Amber, and dodged the sensor scans. I didn't want Cat pulling the truth out of my mind. As I woke up, I recalled that I needed to find the others as soon as possible. I set out to Castle Amber, while taking my artistry supplies along. After encountering no one I knew on the way there, I blurred past the guards and set up my easel in the Pattern room. After several unsuccessful attempts to draw the Pattern, I started on Trumps of the others. And so, there I sat in the room of the fabled Pattern, and drew the Trumps. Kat first, followed by Steed and the others. While drawing, I couldn't help but contemplate the Pattern not two feet from me. The source of unimaginable power. Quite a temptation. The problem however, was that only those of the Blood of Amber could obtain that power. Of course, the blood of Amber can be spilled like any other blood. I managed to get Kesa and Morganth to agree to follow me to Gallifrey, to stop my pitiful assassin. (Pitiful perhaps, but best to send cannon fodder ahead.) Gabriel dropped in on us unexpectedly, in rather bad shape and muttering "Creed...gurgle...". I put him in the medical lab, hooked up an IV (drained a bit of his blood,) and left him there. All was in readiness. I raided the armory and took some of my best technology. And with a whisk of the Trumps, we departed for Gallifrey. For some reason, however, Morganth and I were the only ones who materialized. I had little time to worry about it. Kesa could live or die as she pleased. The Trump was in a storage closet in the museum of antiquities, in the early zinc age wing. After a careful scan, my sensors revealed a Dalek of all things, patrolling outside the door. I popped out and fried it, with a microwave laser burst. Then I set fire to an exhibit, in the hopes of confounding any further attempts to track me by infravision. I shouted back to Morganth to conceal himself climbed to a ceiling support, and took my own advice. I was crouched inside the Dalek shell, when the power went out. Everywhere. As this fact registered on me, I ran to the control room as fast as my legs could move. I examined the device that was tracking my TARDIS, and disabled it. There had been a force field around it, but the power loss had shorted it out. Hmm. Yes. If I could get the video logs for this room, I could find out who had set this up... But for that, I needed an active matrix. I pulled out the Trump, and called Morganth. Morganth obliged me by creating a distraction, and luring Davros out into a corridor. I approached from behind, after sending out several blood spiders as scouts. Once within sight of the two, I threw a stasis grenade between them. It did my hearts good to see that twisted little mockery of sentience frozen in mid-rant. I decided to give him an even chance of survival, by emptying a clip of .45 bullets into the stasis field. Then, remembering Morganth was in there and invisible somewhere, I decided to give him a little...gift. (I closed my eyes and shot into the field at random. If he lived, good. He might still be useful.) I went back around the corridor and waited for the stasis to wear out, then came back and asked Morganth what he had done to reduce poor Davros to a bleeding wreck. I hauled Davros up to a medical lab, fixed the worst of his injuries, and made several alterations to his shell. Then I popped him in a stasis capsule. He would be out of my hair until I figured out a use for him. I was going to let Morganth leave Gallifrey peacefully. He'd been a useful and stupid pawn, just the way I like them. That was, he was off my vengeance list until he flew up behind me, and gave me a wedgie. I exploded a bag of talcum powder in the room, outlining him clearly. Then I politely asked him to place some runes of warding around Davros' capsule. While he was doing his rather primitive magical effect, I snuck up behind him, pulled out the plain simple steel blackjack, and hit him repeatedly in the back of head with it. I then painted a large Trump on the side of the wall in the high council chamber, shoved his encapsulated form through it, and covered the Trump over with red paint. Serves him right for giving me that wedgie. Then I reactivated the power, turned on the planetary shield, and went into the matrix to repair it firsthand. I managed to pull up the video files for the control room, and got a back head shot of the person responsible for this mess. Hmm... It looked like either Corwin or Eric. Which probably means that someone with shapeshifting ability or good video-editing skills is trying to frame them. Nonetheless, I would have to examine every aspect of this. In the meantime, I Trumped my TARDIS. In a panic, I constructed a Trump of the tree world, and went there posthaste. I remembered the second TARDIS falling off the branch.... Constructing a burrowing form, I went after it. After several days of cleaning the interior, the mud-damaged controls were usable, more or less. I sat back and pondered my options. My first task would probably be to find out what had happened to my TARDIS. I started painting another Trump of Amber. episode 7: Abyss Seeing Ya! I returned to the TARDIS to plot strategy, only to be interrupted an hour later by an internal alarm. I checked the monitors to see myself in ridiculous clothes, with a large figure following the clone. Creed. Back from the dead, and carrying another cursed black sword. I ran to the auxiliary control room, and sent the TARDIS into a wild jump. That would keep the Doctor busy for a minute or two. I swiftly moved to a bio-lab, and put on a full body hazard suit. After protecting myself I set up a beaker of toxic flambeau, and set it to circulate through the vents. This might stop Creed, if he breathed it long enough. With the knowledge in the disk I had or the codes imprinted onto my genetic structure, I could make more TARDIS, given time and a high-tech world. Just to rub salt in the wound, I called a Trump gate of the TARDIS interior, and flicked a lighted match into it. Into the atmosphere of flammable, toxic flambeau. And now Doctor, with you out of the way, I resume. Ah, my day had come. The Doctor and his insufferable blue box had fallen, deep into the Abyss. Nothing could save him. Not his incompetent luck, not his well-meaning obliviousness... I savored the moment in the crowd of bystanders, then resumed watching the coronation. 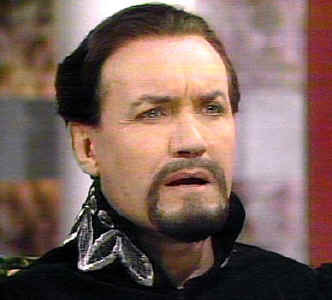 I shifted my features to that idiotic Brigadier, the Doctor's friend. One face is as good as the next. I observed Eric being led away in chains, and followed stealthily. I had suspicions. With a flick of my wrist, I sent a blood insect to retrieve a sample of Eric's tissue. That being done, I returned to the party. Boring. So many powerful and influential creatures, standing around talking about nothing. They could be out carving their own destinies, forging their own dynasties, or killing each other off happily, but instead they chose to spend their time drinking bad punch and talking about the latest fashion styles. And people wonder why I want to control the universe. I departed after I noticed Steed looking at me closely... He knew the Brigadier, no sense risking being found out. I Trumped to Gallifrey, and analyzed the blood my insect had drawn from Eric. Valid, as far as I could tell. I whipped up a batch of liquid that dissolved part of that sample like acid on butter. Then I bottled it, and tucked the vial in my pocket. Just in case, I also altered my system to provide immunity to the liquid. No, I did not want the universe to end just yet. It would be...inconvenient. I drew a Trump sketch in the ground at my feet, and called Steed. He was having his hair done. The universe was about to end, and he was having his hair done. With him channeling the Pattern's power through me, into the sketch, I managed to draw the TARDIS to me... But in mid-transit, it disappeared. Between the Trumps. This was all too depressing. At least the universe was still here. Scout called me again, hours later. A strange creature had tried to kill him, and he wanted my help in interrogating it. I came over, to find him trying to talk to a Yautja. They are interesting creatures, with a culture based on violence, survival of the fittest, and hunting sentients for the thrill of it. I like them. A few questions and a small mind-probe revealed a picture of the one who sicked the Yautja on Scout, and I passed the information along. Then I did as the creature's honor demanded, and helped it die by the blade. After I left Scout's, I sent the body of the Yautja back to it's people, via a hyperspace probe. They have odd funerary customs. (I don't get this sentimental about most races, but these creatures are useful pawns. And I definitely like their outlook.